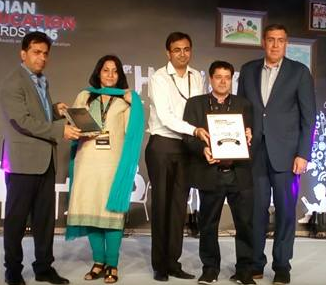 Eduwizards, India’s leading tutoring platform has received the ‘Best Online Tutoring’ Award at the prestigious Indian Education Congress Awards – 2016. The award recognizes and felicitates organisations who have achieved excellence in the education sector. Eduwizards.com technology platform, with 18000 tutors and counting, allows students across India to connect with the best tutors for both Home Tuition and Online Tuition. The two-day conference brought together the industry veterans to interact and draw attention to best practices and promote innovation to capture consumer interest that will help grow the Indian Education Sector. Prominent speakers present at the event were Mr. Krishan Khanna, Chairman & Founder, iWatch Foundation, Prof. Dr. Madan Mohan Pant, Founder & Mentor, Planet Edu, Mr. Shiv Khera, Founder of Qualified Learning Systems USA, Prof. Dinesh Singh, Former Vice Chancellor, University of Delhi, Mrs. Manjula Pooja Shroff, Chief Executive Officer, Kalorex and many more. Industry leaders spoke about the latest advancement in the field of education and how technology is transforming the education industry. They also laid emphasis on the modern outlook on curriculum, programme delivery and training, new methodologies, teacher quality and school improvement, values, strategy and implementation. Speaking on the occasion, Ashish Sirohi, Co-founder, Eduwizards said, “We are delighted to have been chosen as the best online tutoring online platform. This award is a testimony to the growing appreciation of students who have connected with top-rated tutors through our platform. We provide the best tutors, openly ranked and reviewed by students. We are a pioneer in the industry. We have leveraged our vast experience in providing online tutoring within the USA (and globally) since 2007 and in August 2015 started providing tutoring to Indian market too." Indian private tutoring market is estimated to be worth $11 billion. The current size of overall private coaching in India is about $23.7 billion and is likely to touch $40 billion by 2015, says Assocham. With nearly half the population of India below the age of 25 years and increasing penetration of Internet and mobile devices in this demographic, the growth of online education in India is undeniable.